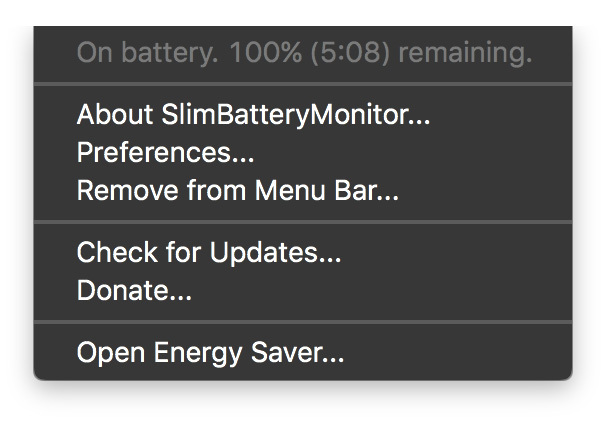 Apple took away the time remaining estimate from its Battery menu bar widget in macOS 10.12.2 presumably because it was inaccurate and confusing. That’s a problem because a lot of MacBook Pro, MacBook Air, and MacBook users rely on the time estimate to get an idea of how long they can go before they have to find a power outlet. Even though Apple deemed the time remaining estimate unnecessary, other developers get that it’s an important feature. Read on to see some of TMO’s favorite battery monitoring apps. 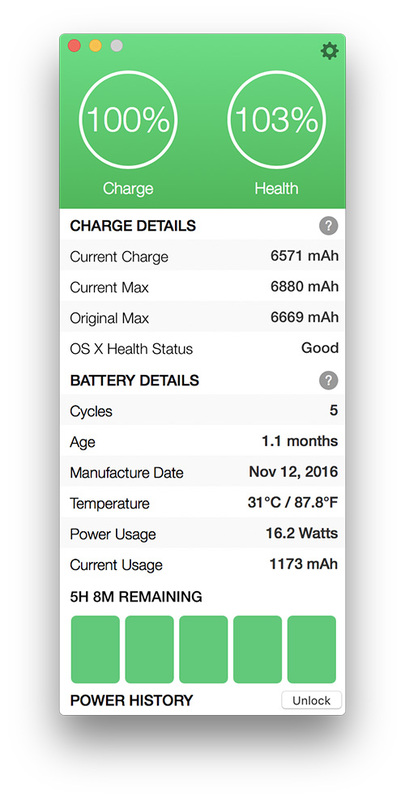 Battery Health 2 from FIPLAB shows how much time is left on your battery’s current charge, plus you can see it’s age, the number of charge cycles, the battery operating temperature, and how old it is. It’s a free download from the Mac App Store and offers in-app purchases if you want to see your power usage history. SlimBatteryMonitor may be old, but it still works. It shows your charge state plus how much time is left on the current charge, and it can hide itself to free up menu bar space when you’re battery is fully charged. SlimBatteryMonitor is a free download from the Orange-Carb website. 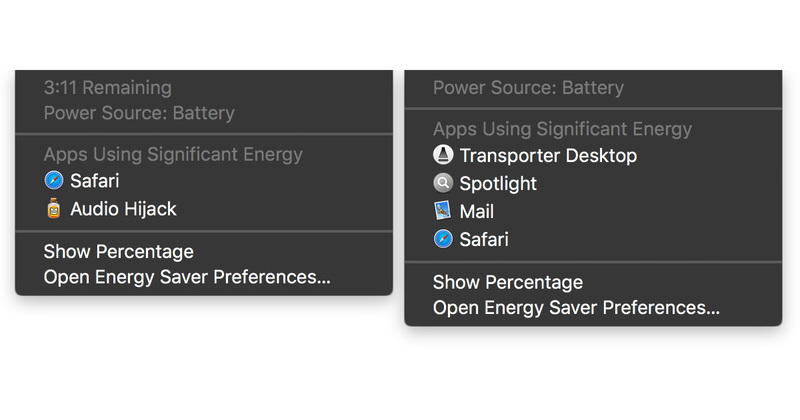 iStat Menus is the go-to information center for many Mac users because it shows CPU load, memory usage, network activity, computer temperature, and battery usage information. 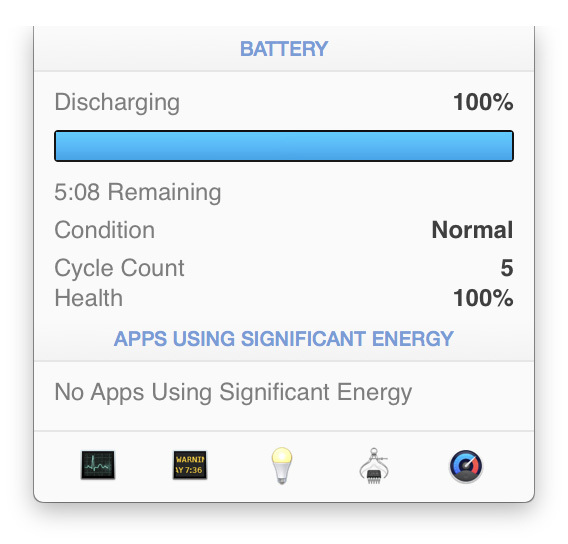 The Battery menu bar widget shows current charge state, a time remaining estimate, charge cycle count, and which apps are sucking down the most power. iStat Menus costs US$18, or $25 for a family pack, and includes a 14-day free trial. You can download it at the Bjango website. 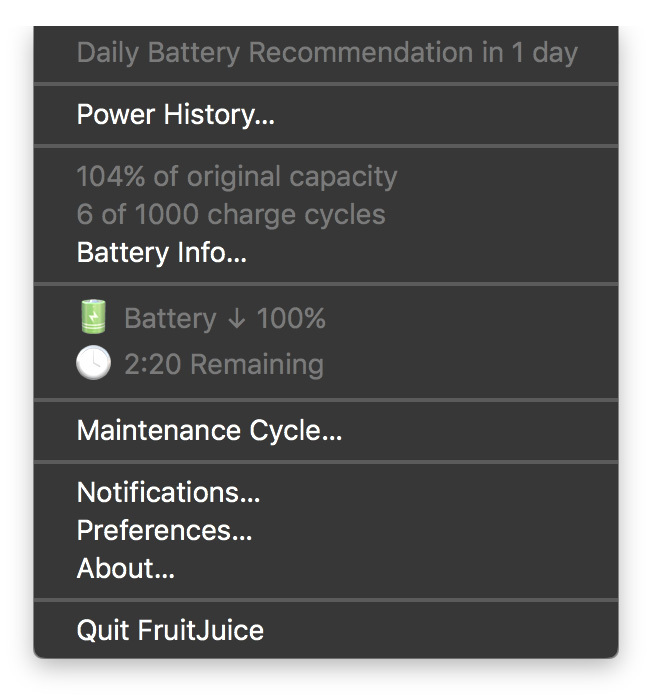 FruitJuice shows your Mac’s current charge status and estimated time remaining, plus a lot more. It keeps a detailed log of your charge cycles, and suggests when to run from your laptop’s charger or battery to get the best battery life possible based on your actual computer usage. It’s a Mac Geek Gab favorite, too. FruitJuice is a $9.99 download from Apple’s Mac App Store. I greatly recommend iStat Menus. Its one of the first things I install on a new Mac and a must have application. It really is the best for monitoring almost all aspects of MacOS systems.